American breakfasts are epic. We're not talking bacon butties here. Even your coffee seems to come with a huge Danish pastry as standard! When we started planning our trip to the States I Googled 'best breakfast in San Francisco'. 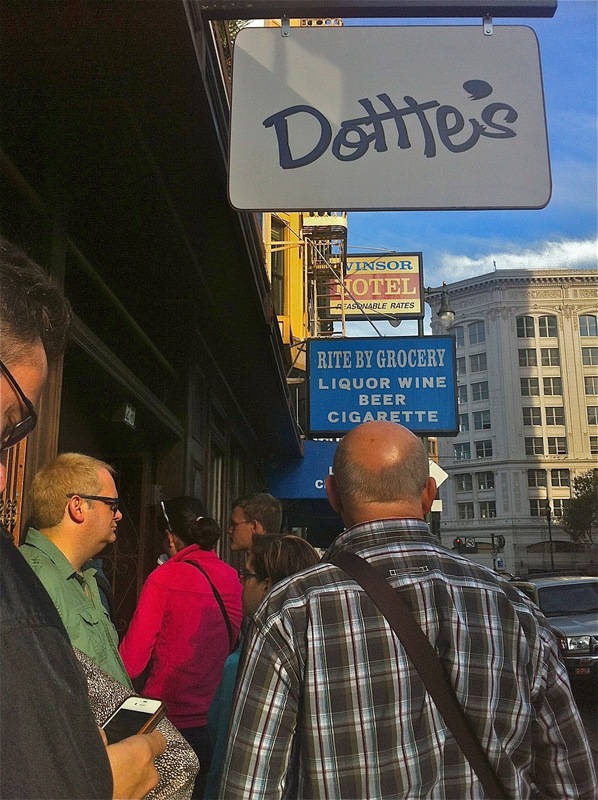 Dottie's was a feature on nearly every review site. If it wasn't top, it was damn close. Most of the reviews mentioned that you had to queue for about an hour to get in and that the neighbourhood wasn't the best. However, I thought (as BJ would say) the juice was worth the squeeze. I looked at the menu again a bit closer to the time and saw that they had moved. Nice one! I'll be honest with you... the location is a little ropey in the morning, but it's ok. We got there at about 9.30am on a Sunday morning and they were already queuing round the corner. We had geared ourselves up for this, so it mattered not. We waited around 45 minutes, which wasn't too bad. The queue continues inside, so you get to have a nose at the goings on in the restaurant before you are seated. Rather than being packed to the rafters, it's clear that the queue outside is a way of managing the number of covers inside. Service is fast and tables are turned round as soon as customers are finished, but no-one is ever rushed. There are empty tables in order to control the number of orders. We were starved. Nothing whets the apetite like watching what other people are ordering and eating! My husband ordered the Open Road, which consisted of juice, two eggs (your way), home fries, your choice of bacon, sausage or ham and two pancakes with maple syrup. I opted for the quintessential American breakfast in the form of pancakes. Hell's teeth. When they came the waiter was clearly having problems holding the plates! These pictures give you no idea of scale. Even the eggs were huge. My pancakes (the ones at the bottom) were the size of dinner plates and came with a full jug of maple syrup. A full jug. Whereas my husband polished most of his, I only managed to snaffle one and a bit pancakes. Pitiful. The great thing about American restaurants is that they hate waste. They always offer to package things up to take with you. In my case I politely declined, as the thought of eating anything batter fuelled for the next month was rather upsetting. Dottie's is a wonderful place to go and chill out, and eat your breakfast in a relaxed manner. Coffee refills come as standard, and waiters are attentive without pestering. This is a very laid back affair. All baked goods are home made and everything is cooked fresh to order. They are very proud of their food, and take any opportunity to explain in more detail. If you're ever in San Francisco, you must go to Dottie's. The wait really is worth it!